Let the light shine! Celebrate your inner light with the wonderful light of celestial bodies including sun, moon and stars, plus representations of inner light such as yog and meditation. Click any item for more info and to order. 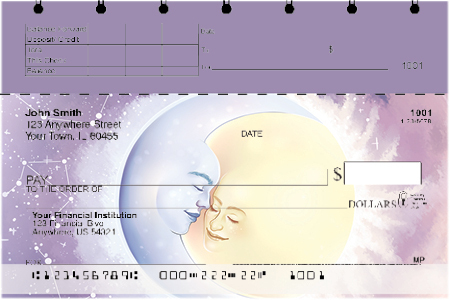 This blue checkbook cover is illuminated by the glowing light of a crescent moon that's overflowing with colorful stars. Four rotating scenes of solar and lunar astrology glittered with stars.